Bitcoin is a world of international finance that is encrypted and peer to peer. Bitcoin as the object of my study, leads to interest in cultural and financial networks. As a non-centralised form of money, people on the Internet, with an application download, can immediately become partners in a global economy, with the lowest fees and no third-party controls. The region of East Africa is the world’s most expensive for remittances [transfer of money by a foreign worker to an individual in home country], because of factors such as limited competition and regulatory barriers. In Kenya, where overseas money transfers represent 3 percent of the country’s GDP and, 46 percent of financial transactions are handled with mobile phones, I have identified a case study for exploring Bitcoin’s viability as a financial tool. Kenyans have mobile money embedded into their daily lives and, lead the world in mobile money innovation. The country has been on the forefront since the 2007 launch of M-Pesa, the M is for “mobile”; Pesa is Swahili for “money.” What was originally conceived as an efficient method to make payments on micro-loans has been rapidly adopted by Kenyans as a way to send money from urban centres back to rural areas. Nearly two thirds of the local unbanked [under-banked], population use the service. I wanted to learn if Bitcoin could ride M-Pesa’s success of explaining mobile money. After my first couple of days outside of Nairobi, I understood that M-Pesa’s greatest achievement is its vast network of agents; reaching 70,000 at the time of writing. One of the things that the video cannot do justice to in the time available, but is also part of M-Pesa’s successful story; analysts suggest the violence in 2008 was a critical accelerator for the service. During the post-election violence, M-Pesa was used by urband dwellers to send money to relatives trapped in the home-towns and slums. Another controversial reason [which is represented in the video],being the applied research, the Kenyan trip revealed that M-Pesa’s innovator [Safaricom Mobile Provider], succeeded because of its status as a monopoly. This ensured the investment in technology, where an agent network was protected, lead to an easy dominance of the mobile money transfer industries. 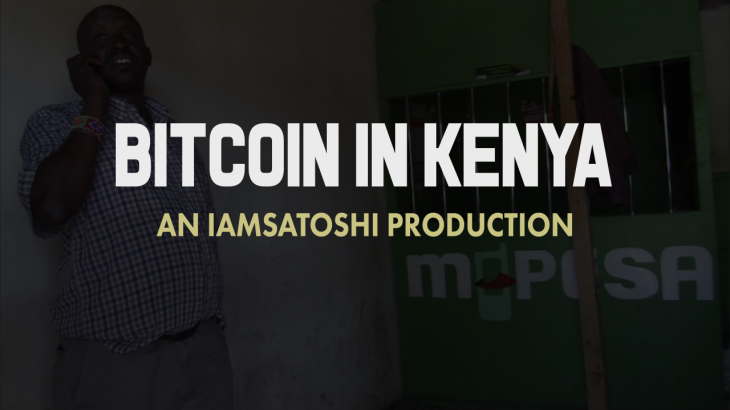 Bitcoin In Kenya‘s style is framed by an investigative approach to expose Bitcoin as a global digital currency, as well as a ground-breaking technology. It is a journey between rural-unbanked Kenya to Nairobi’s technological start-up hub. This was a lived experience, an invaluable addition to my research about global finance on a specific, local level. hand for a while until Bitcoin use is more widespread. Bitcoin solves a Major issue in Kenya that involves the lower Middleclass. before all the networks in Kenya start using Bitcoin. that the Bitcoin Community needs to find a way of getting Bitcoins to us. and many are shut down mid stream. rule says they are NOT to accept any matrix system to use their facilities. This applies across the board for ALL central Bank licensed financial institutions. developed and the structures were in place for automating our payment system. articles and videos have been posted at http://www.pesamob.com/blog.ph…. System! With over 800 members 594 of whom are paid up, there was shock and awe! well while others are extremely UPSET! The adoption is quiet amazing BUT it will require a great deal of education. there ESPECIALLY you – a Bitcoiner becomes the Bottom. Panare Indians. In their language, they didn’t have words for “evil” and “sin”. which “God” said that the Panare’ killed Jesus, and needed to be saved! The Book is – Jesus Against the Indians:Who Won That War? keep opening accounts until your earnings are used up. Use the link http://www.pesabit.com – this is a revolving URL with 800 members. spend them as they are. member under who you join will immediately earn 0.08BTC. to the less endowed would be much greater. Please Join us. The link http://www.pesabit.com is a rotator url for 800 members! We intend to go East Africa, Africa and global. paying out in Bitcoin automatically! for which we have already set up a gateway and https://btcjam.com. tea farmers and coffee farmers. which is already in place and ready. Please review this idea and see how you can get involved. Help us build the Bitcoin ecosystem!